The Walled Garden at Knightshayes Court | Edimentals ! I thought then it would be fitting to post an album of pictures taken during a memorable visit to a National Trust walled garden in Devon, a garden that features in my book Around the World in 80 plants. I wasn’t to be disappointed! Not only that, there were several cultivars of Allium ampeloprasum on display, another species I was researching for my book amongst many other mouth watering vegetables! 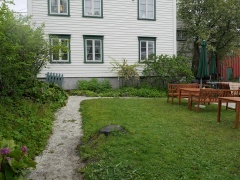 Berit told me that there was a small garden near the city centre where you can see a collection of old garden plants from Northern Norway, so here are a few pictures!